Written by Tim Ingham — Pandora’s active user count is at its lowest point in two-and-a-half years – despite the recent launch of a subscription service which is supposed to save the company. According to fresh SEC documents analyzed by MBW, the platform’s total active user count in the 30 days to end of March this year stood at 76.7m. Compared to the previous year, that figure has shrunk by 2.7m people. Bear in mind that Spotify’s paying subscriber count – not just free users, but actual cash-spending customers – grew by 10m just in the six months to March this year. According to a new report from CNBC, Pandora is now actively trying to sell itself within the next 30 days. To be frank, any prospective buyer better have balls of steel. Or a magical turnaround plan. Yesterday, Pandora posted a $132.3m net loss for the three months to end of March. That’s a widening of 15% on the the $115.1m net loss posted in the same period of 2016. Pandora’s latest quarterly revenues, meanwhile, grew at a slower pace – up 6.3% YoY to $316m. The company’s guidance suggests it expects to post a net loss in this quarter (the three months to end of June) of around $110m – $125m. Here’s where things get grisly. Last year alone, Pandora posted a $343m annual net loss. More than a third of a billion dollars. Combined with its Q1 2017 and expected Q2 2017 losses, that figure will soon easily top half a billion dollars (at approx $595m) across just 18 months. To date, not even counting the $110m+ Pandora expects to lose in the current quarter, the company has cumulatively torched $734.5m. By the end of calendar 2017, it’s highly likely that at the current run-rate, Pandora’s lifetime losses will sail past $1bn. So what of Pandora’s dual subscription service – the $4.99-a-month Pandora Plus and the $9.99-a-month Spotify clone Pandora Premium? The firm announced yesterday that it now counts 4.71m paying subscribers amongst its shrinking user base. Unfortunately, that’s not as impressive as it first sounds. Pandora Plus was essentially a replacement for another $4.99-a-month service, Pandora One. In Q1 2016, Pandora confirmed that Pandora One counted 3.93m subscribers. 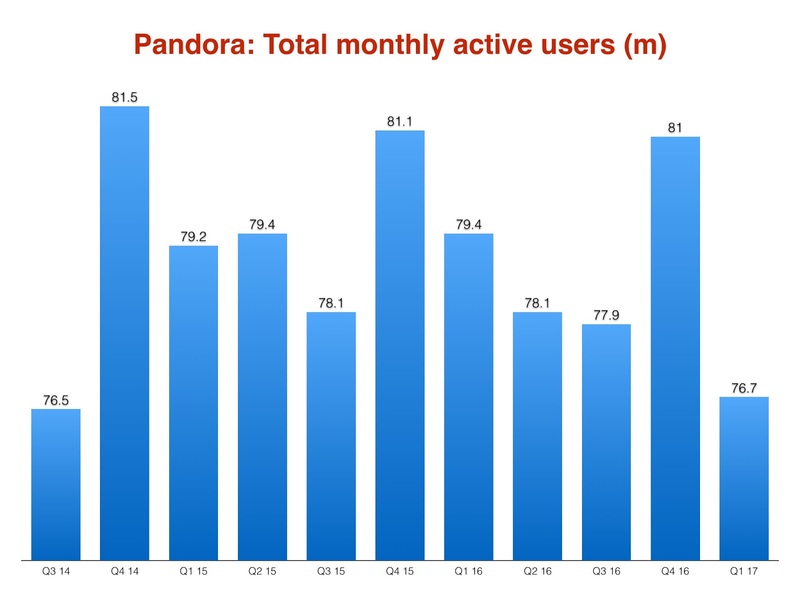 So Pandora only managed to add… 780,000 paying customers in the subsequent year. To be fair, that’s only really a reflection of the rejigged Pandora Plus service, which launched in September last year. As for its $9.99-a-month Pandora Premium product, the company confirmed yesterday that over 500,000 users signed up for a free trial after it became available in March. Even if all those triallsts start paying full whack, however – and even if Pandora could somehow hold on to a margin of 30% – it would still only make the company $18m. It’s fair to say we’re way past that figure scratching the surface of Pandora’s annual monetary issues. Pressure is now piling on Pandora’s board to sell – and not only from once-loudmouth outsiders like 10% stakeholder Corvex. The firm’s current share price stands at $10.02. That’s 21% down on where the stock price was as recently as January 3 ($12.72), and a massive 73% down on its high point in February 2014 ($37.42). To put that into context: Pandora’s current total valuation (market cap) stands at $2.35bn. That’s approximately $650m down on what it was worth just three months ago. And it’s approximately $6.4bn down on what it was worth in February 2014. Most galling of all: SiriusXM majority owner Liberty Media reportedly put in a $3.4bn bid for Pandora last summer… which was rejected. That’s over $1bn more than the company’s current valuation. Eeesh. Are there any more hidden costs around the corner for Pandora? Well, yes – and they’re not insignificant. According to its latest SEC filings, as of March 31, 2017, Pandora has future minimum guarantee commitments of $686m to pay music content rights-holders. $278.6m of this money must be handed over in 2017. Pandora ended the first quarter of 2017 with $203m in cash, cash equivalents and investments. You’ll notice that’s not enough to cover this year’s pre-agreed content bill with labels and publishers. And Pandora, remember – as we’ve extensively covered here – is a business that loses money. Issues like these are a key part of the reason why Pandora has just agreed to take on $150m in investment from hedge fund giant KKR. As a result, Richard Sarnoff, KKR’s Head of Media & Communications for Private Equity investing in the Americas, will join Pandora’s Board of Directors. But there’s a twist: if Pandora manages to sell itself within the next 30 days, the KKR deal would be off – and it would only have to pay the investment company a $15m kiss-goodbye fee. This looks for all the world like a short-term lifeline: if Pandora fails to sell this month, and ends up taking on KKR’s money, you can expect its $150m cash injection to last around four months (judging, once again, by those hefty net losses). Once this stack has been burned through, Pandora risks look more frail and more financially exposed than ever before. It was once an industry pioneer. But now Pandora needs to find a buyer, and fast – or it could be facing up to a terminal fate.